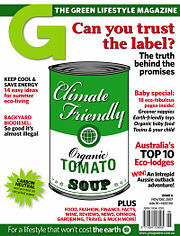 G Magazine is an Australian magazine, published in Sydney since November 2006. It is an eco-living title for people who love life, their lifestyle and the planet. G Magazine began as a bi-monthly publication, and changing to monthly at the beginning of 2008. Wilson da Silva is the editor-in-chief of G Magazine. Sara Phillips, is G Magazine's editor. The magazine is a stylish guide to green living in the 21st century. It's aimed towards environment-friendly consumers who want to reduce their impact on the planet but don't want to compromise on quality of life. Every issue features ideas for greener living, and practical, evidence-based solutions to living a more environment-friendly lifestyle. Editorial advisors include Sir Richard Branson, British entrepreneur; Dr Tim Flannery, 2007 Australian of the Year; Dr Jane Gilmour, past executive director of Earthwatch in Australia and expert in water management; Patrice Newell, former TV presenter turned biodynamic farmer and author; and Cathy Zoi, former Chief of Staff of Environmental Policy in the Clinton White House. At the 2007 Bell Awards, G was awarded Consumer Magazine of the Year (consumer category, print run over 30,000) and Best Magazine Launch from industry body, Publishers Australia. It was also highly commended in separate categories for its editorial, design, publishing and advertising sales. In 2006, editor Sara Phillips won a 2006 Reuters/World Conservation Union Award for Excellence in Environmental Reporting. G magazine was first published by Luna Media until it was acquired by Nextmedia in 2009. Nextmedia Pty Ltd (styled as nextmedia) is an Australian media company founded in 2007 and owned by Wolseley Private Equity, which is situated in St Leonards. It was founded by four individuals: Melbourne neuroscientist, entrepreneur and Monash University's (Melbourne) Dr Alan Finkel, magazine publishing executive Kylie Ahern and science journalists Wilson da Silva and Elizabeth Finkel. This page was last modified 08:51, 22 May 2012.